This archive page gives me a place to store the old Moosey garden calendars from 2009. Some of the older photographs are just beautiful, and the same days and dates combinations will return some year. Soon these old calendars will be able to be recycled. Yippee! With the passing of gardening time the Moosey Cats come and go, the Moosey dog gets older and more respectable, and the garden changes - from worse to better? Hmm... Anyway, here's my calendar collection. All are still available to download, free, should you want to. My first 2009 Garden Calendar was an attempt to encapsulate a year in the life of the Moosey garden, its pets and people. I cheated just a little - there were no seriously cold winter photographs. Who needs these? The layout was inspired by a technological discovery - hello Photoshop! I learnt how to create cute little thumbnails of my garden pictures - I have over three thousand of these (not joking). But like having three thousand daffodil bulbs - what to do with them? Ha! Space must be found, they must all be planted, their flowers enjoyed... The result was a pretty, colourful calendar for 2009. I printed my own and sent them to friends and relations as Christmas presents). Please enjoy the garden scenes - if bored, you could count the cats (I think there are eight) and dogs (both Rusty and Taj-Dog, the original Moosey canine) in the thumbnail pictures. You might also catch a glimpse of Non-Gardening Partner mowing the house lawns. The Moosey Garden Partners Calendar, 2009 version, gave me the chance to show my most successful pictures of garden companions. All gardeners understand the value of good neighbours - and plants in the garden do, too. Often by accident I'll place two plants next to each other and get 'it' right, creating a perfect pair. 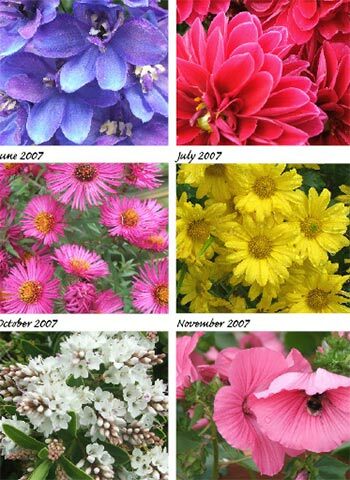 In the year 2009 I proudly presented a new Moosey Flowers Calendar. I used photographs from my own garden - only picking the freshest and the best. No weeds were allowed! I produced two Moosey Roses Calendars in 2009, and here they are ready for recycling - when the days and dates match up again! And of course, like all my other Moosey calendars, they are free to download. 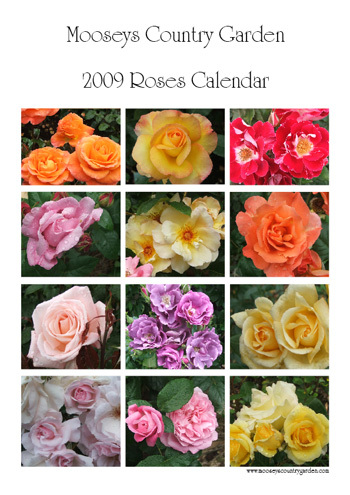 The first calendar featured home-grown roses. I had fun choosing my favourite rose photographs - but which beauties to leave out? There was no subtle air-brushing to remove black spot off the leaves, either. For the second Moosey Roses Calendar I went further afield than the confines of my own shrubby rose garden to choose the images. You'll enjoy the luscious colours of Sam McGredy's hybrid teas, photographed in the Christchurch Botanic Gardens. 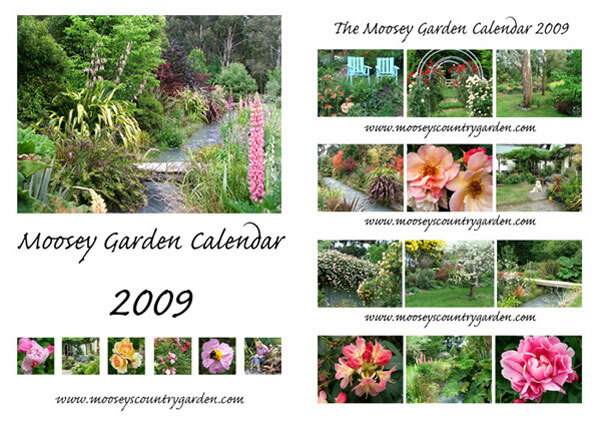 Like my other original calendars, the 2009 Moosey Roses-2 Calendar was produced as a Christmas present for a gardening friend. She asked for pictures of hybrid teas. Colour in the garden gives so much energy and life, from flowers and foliage to the big blue sky above. My Moosey Colours Calendar has all the colours of the rainbow - and just a touch of nature's greenery. Beautiful New Zealand - a clean green land which is so proud of its scenery. I've created a calendar with photographs from my many journeys hiking in the mountains and valleys of Canterbury, in the South Island. This is the 2009 version. The images I've chosen show the tremendous variety of day trips I've experienced, since becoming a full-time lady gardener. I'm allowed one day off from my garden duties per week, and I'm not allowed to moan about sore feet or tired legs! All my 2009 calendars are in a PDF format, and can be downloaded and printed for no charge.